Quispamsis, N.B. 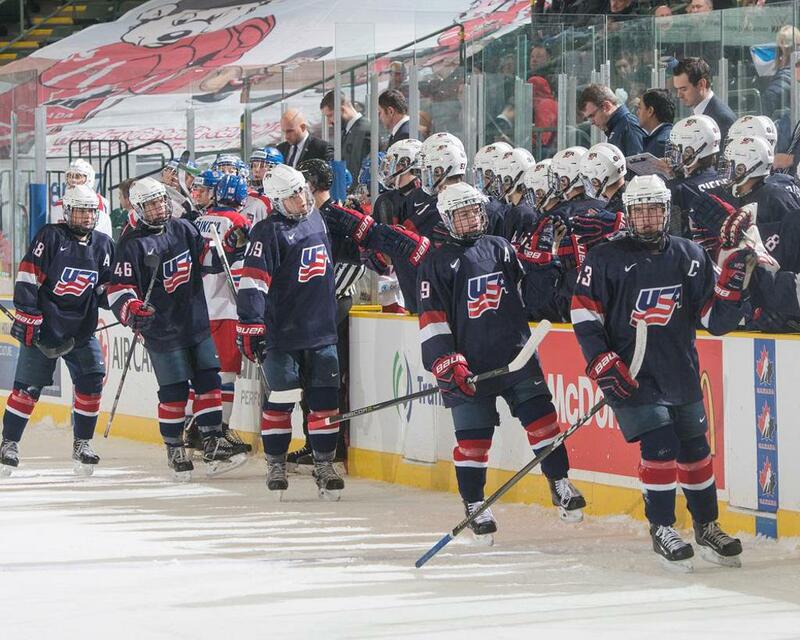 -- The U.S. National Under-17 Team faces Canada Red at 7:30 p.m. local/ 6:30 p.m. ET in the quarterfinals at the 2018 World Under-17 Hockey Challenge in New Brunswick. The U.S. fell to Canada Red, 5-2 Thursday night in its exhibition game. Daniyal Dzhaniyev (Brooklyn, N.Y.) and Eamon Powell (Marcellus, N.Y.) netted goals in the loss. 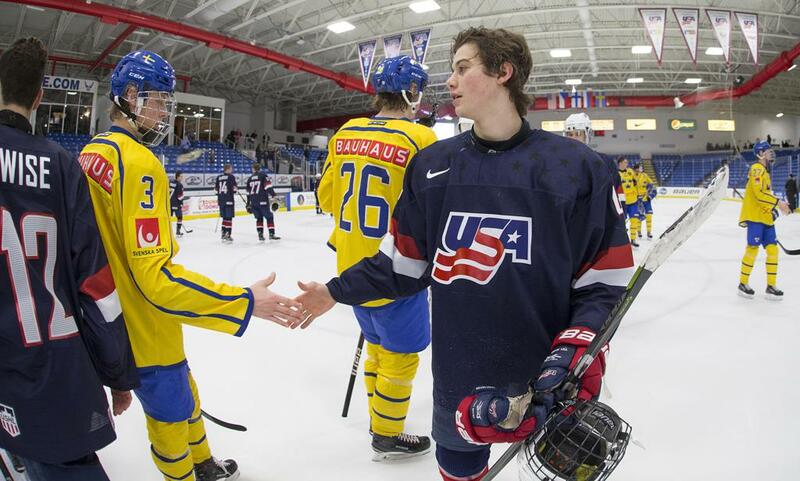 The U.S. National Under-17 Team fell to Canada White, 5-2, in its second preliminary game. Ty Smilanic (Elizabeth, Colo.) netted two goals in the loss. The U17s have won the World Under-17 Challenge five times since 2001, last winning victory coming in 2017. During that tournament, the U.S. Under-17 Team went 7-0-0-0 in Dawson Creek, British Columbia. The U17s finished in seventh place in its last tournament held in New Brunswick in 1995 with a 2-2-1 overall record. Team USA has finished in the top three 15 times; first place in November 2017, 2014, 2010, 2002 and 2001; second place in November 2014, 2012, 2011, 2008, 2006, 1998 and 1996. Last year, and Hughes led Team USA in points for the tournament with 15, and Cole Caufield (Stevens Point, Wis.) led the U.S. in goals with eight. Both were also named to the media all-star team. The U.S. National Under-17 Team is lead in points by Thomas Bordeleau (Houston, Texas) who has 13 in 16 games. Owen Gallatin (Hugo, Minn.) leads all defensemen in points with eight assists. The U.S. leads the World Under-17 Hockey Challenge tournament in most goals scored in a preliminary round with 20 in November of 2014. They also lead in fewest goals against for the tournament, allowing only six goals in January of 2014. Colin White leads the entire tournament history in points when he notched 18 (10G, 8A) in Jan. 2014. The U.S. hold three of the top five ranked players in tournament points, with Jack Hughes in second with 15 and Rocco Grimaldi in fifth with 14. Michael Lackey leads the U.S. in tournament goaltending statistics, when he recorded a 0.958 SVS% and 0.75 GAA in Jan. 2014. Seth Appert (Cottage Grove, Minn.) will lead the U.S. National Under-17 Team along with associate coach Nick Fohr (Grand Forks, N.D.), intern assistant coach Jared Nightingale (Jackson, Mich.) and goaltending coach Thomas Speer (Janesville, Wis.). Twenty members of the U.S. National Under-17 Team players are in Saint John, New Brunswick to compete in the World Under-17 Challenge, their first international tournament play with the NTDP. The U.S. National Under-17 Team will return to international play once again when USA Hockey Arena hosts the 2018 Four Nations Cup Dec. 11-15.